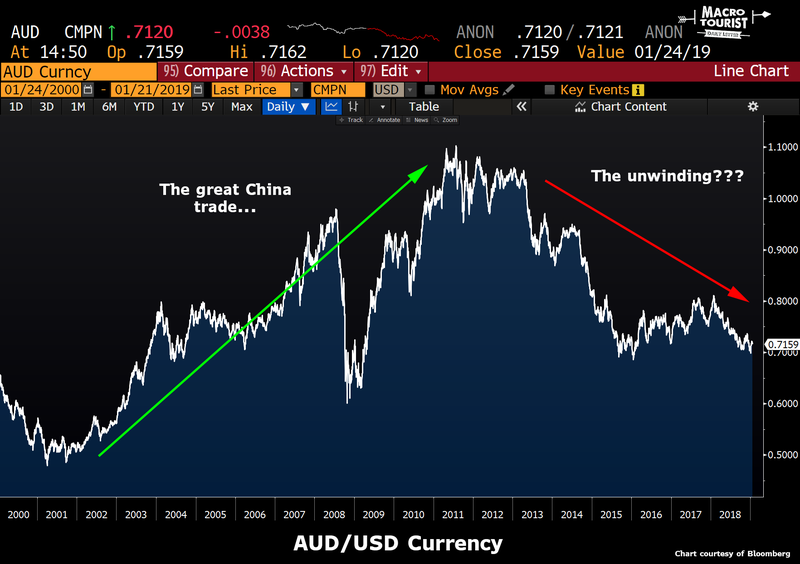 ﻿ The Macro Tourist | BEST WAY TO SHORT CHINA? BEST WAY TO SHORT CHINA? Global risk markets have recently taken comfort in the Fed’s change of rhetoric along with Mario Draghi’s talk of pulling out the “monetary toolbox”. When combined with the Chinese government’s cutting of the reserve requirement ratio and other stimulative measures, it’s easy to see why sentiment shifted this month. Yet the headlines out of China are getting scary. 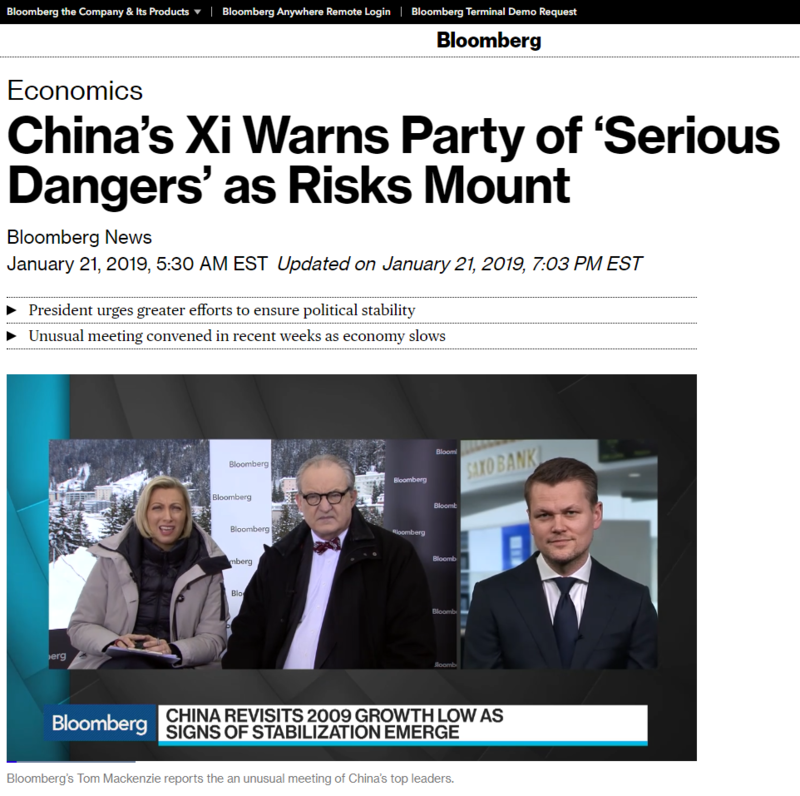 This morning Bloomberg is reporting on a special message from the Chinese leader. China’s economy is not in good shape. Nor is dropping the reserve requirement ratio and cutting some tax rates going to turn it around. The truth of the matter is that we are now nine years from the Great Financial Crisis and China’s aggressive stimulus following that crisis has resulted in some rather uncomfortable mis-allocations of credit that need to be corrected. These fixes will not be easy and they will not be painless. China is not immune to laws of the business cycle even with their command economy. Xi is preparing his country for more difficult times ahead - not getting ready to make some landmark deal that gives the US everything Trump wants. Now don’t get me wrong - there will most likely be a deal. It’s in both countries’ interest to stop the bleeding. Yet the deal will not be enough to stop the slide in the Chinese economy. I don’t need to reproduce all the scary graphs of the Chinese debt buildup. Or the astounding unprecedented size of growth in the Chinese economy over the past two decades. Everyone knows the bear case as they have been hitting us over the head with it for the past decade. What’s different now is that the slowdown has clearly started. Instead of being some theoretical eventuality, the process has begun, and it’s too early to assume it will be an easy fix. Felix: China I believe is in an interesting position right now. You heard President Xi’s speech last week, and in 2021 there is the 100th anniversary of the Chinese Communist party and it’s very clear that they want to have a strong economy at that time. If you want to have a strong economy in 2021, you stimulate in 2020. And they are central planners. So that’s means they have to take their foot off the pedal in 2018, 2019. I think in ‘18 and ‘19, they will address the imbalances in the financial sector and that will slow down the Chinese economy in ‘18 and ‘19, which will also slow down the rest of the world. So we are entering a period where sometime in ‘18, I would say the peak of the market will be in the first half, the peak in the economy is probably from mid-2018 on, and then we slow down into 2020. That’s why I think the leader of this cycle, China, is going to slow down next year. Barry: So the whole global economy is dependent on President Xi’s re-election desires in 2022? Felix: As I said before, you always need to figure out what is the leading theme in the market cycle. In the last cycle, it was real estate, in this cycle it is China. And that’s why China is so important. China is the second largest economy, and in 10 or 15 years, it will be the largest economy of the world. So let’s recap; China has finally started their long-awaited slowdown/economic-correction. Yet markets are optimistic that between a trade deal and stimulus, the Chinese government has got this under control. But there is little reason for the Chinese government to give in on a trade deal (Xi is appointed for life and doesn’t feel the pressure from each downtick in the Chinese stock market). Nor does Xi need to stimulate in a serious fashion at the first signs of economic slowing. Sure, he doesn’t want it to spin out of control to the downside, but to think he will waste bullets at this juncture does not take into account the longer term game he is playing. As their economic miracle comes skidding to a stop, the Chinese will lightly apply a little gas, but they are by no means desperate to arrest the decline. Re-read Xi’s address. 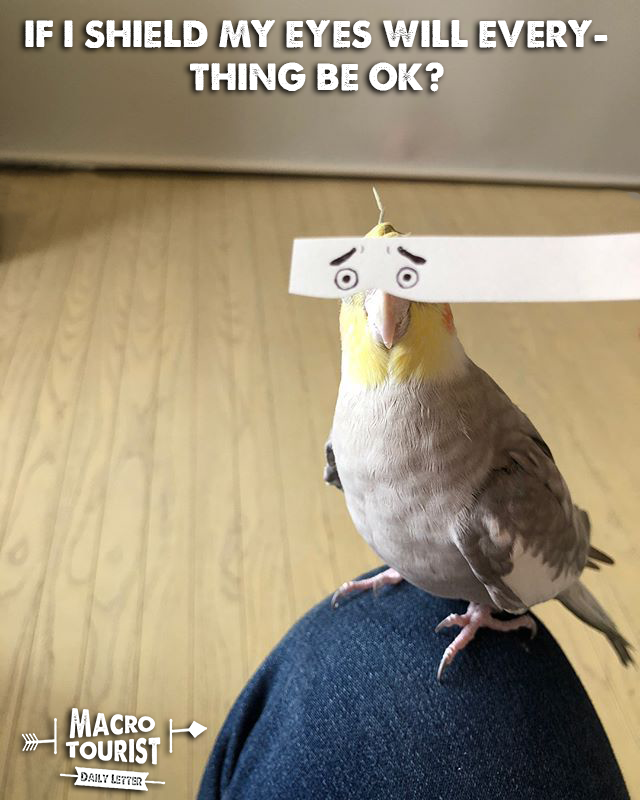 He is preparing everyone for more pain ahead. He is telling his party members to pucker up and get ready for some medicine. And the medicine will not taste good. The Chinese currency is managed. And that means it is a political process. 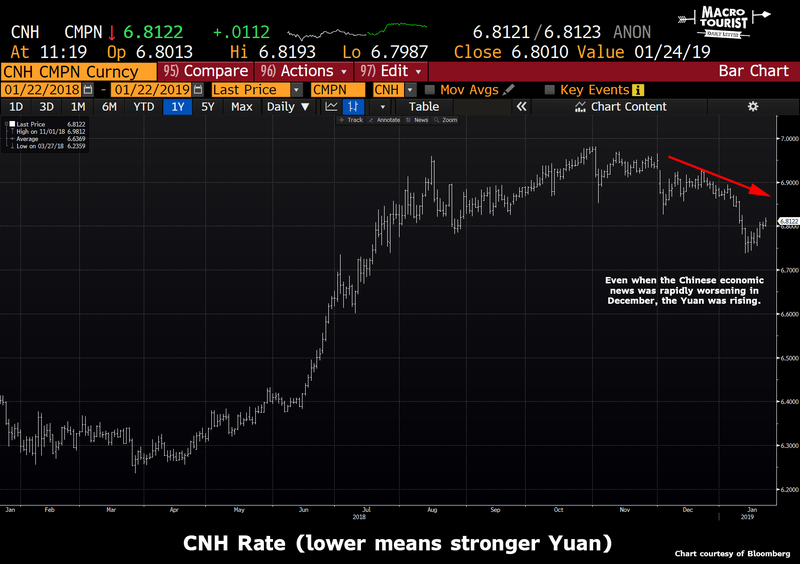 Sure you could take the view that eventually the Chinese will be forced to revalue lower (higher CNH), but I would rather find an asset that gives me feedback on a realtime basis that more accurately reflects current economic conditions. To my mind, Australia is the perfect vehicle to express my belief that the next year will continue to be difficult for China. No other major country has benefited more from the Chinese economic miracle than Australia. They are almost an economic miracle in their own right. Have a look at their nominal GDP growth over the past half century. 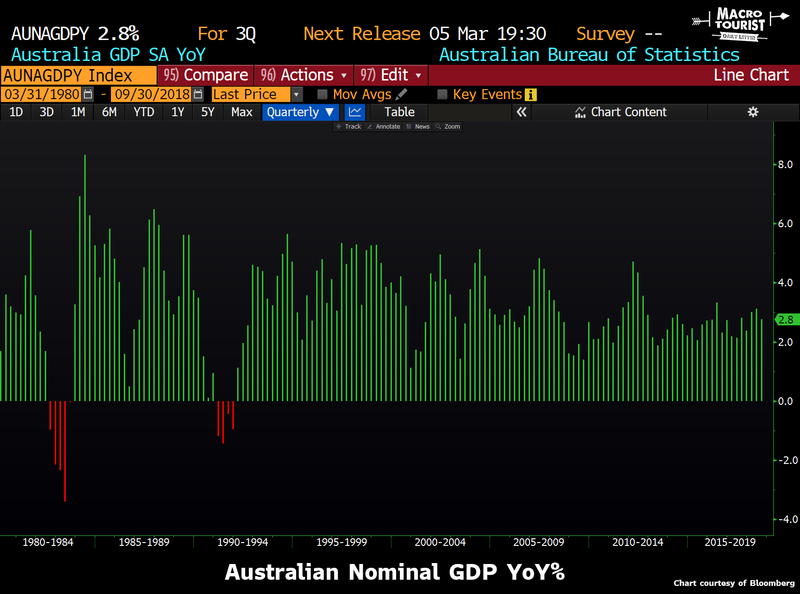 It’s been more than 25 years since Australia has suffered negative nominal GDP results. Sheesh! Same deal. 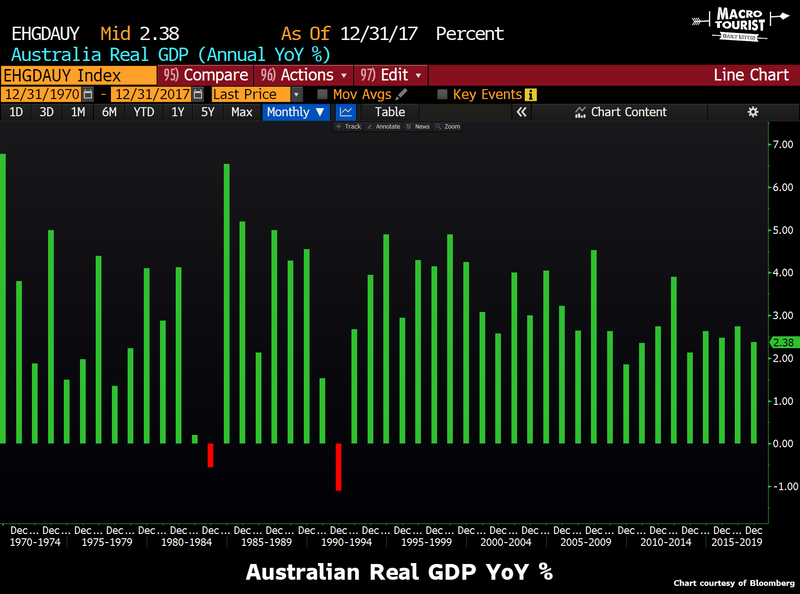 These Australians sure know how to grow an economy. But are they really so adept at repealing the business cycle? Or were they the lucky recipients of China’s insatiable desire for resources? And most importantly, if China experiences another difficult year, what will this mean for Australia? 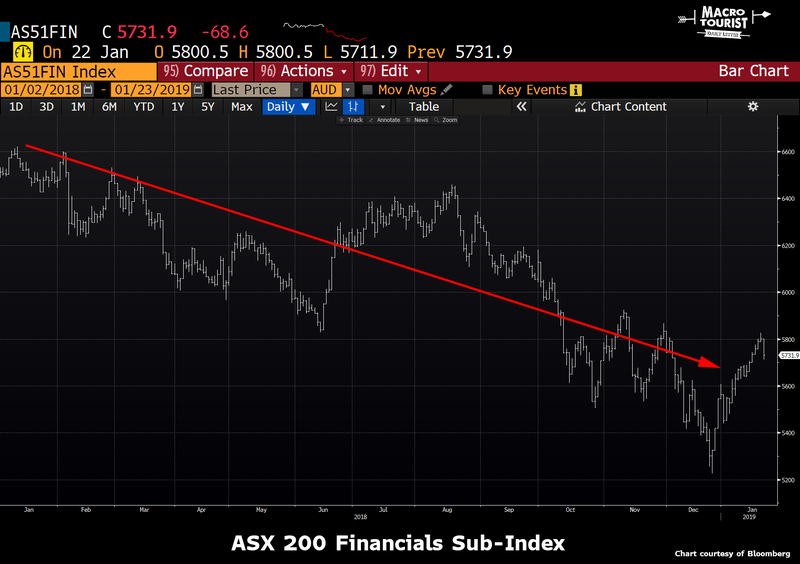 I am not sure if there are more perma-bears on China or Australia, but both camps are crowded. Australia has experienced a world-class real estate bubble over the past decade with stories that will eventually fill a Michael Lewis book. Yet the bears have been warning about the coming collapse in Australia for what seems like an eternity. The market is finally agreeing with their position. Not hard to figure out that the trend is down. The Australian economic slowdown is also manifesting itself with slumping real estate prices. 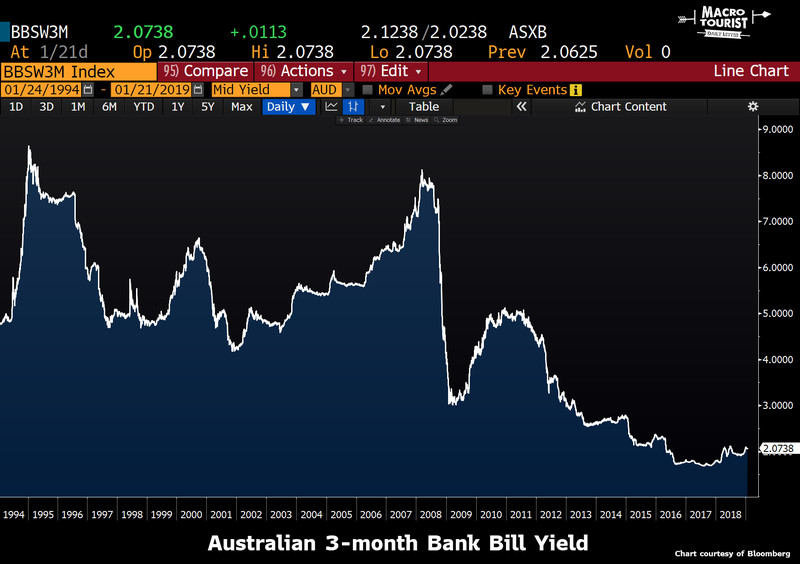 It’s even worse when you look at Australian rates versus the US. 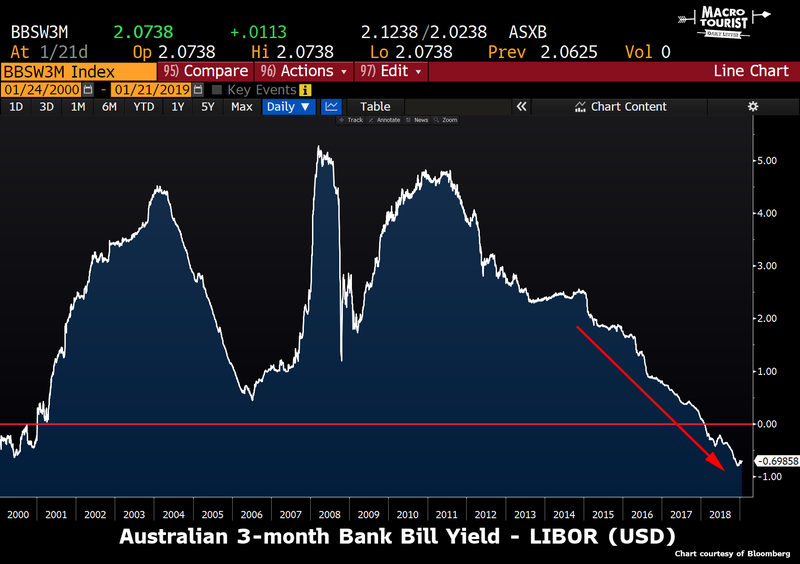 The trend towards lower relative rates in Australia is pronounced and clear. 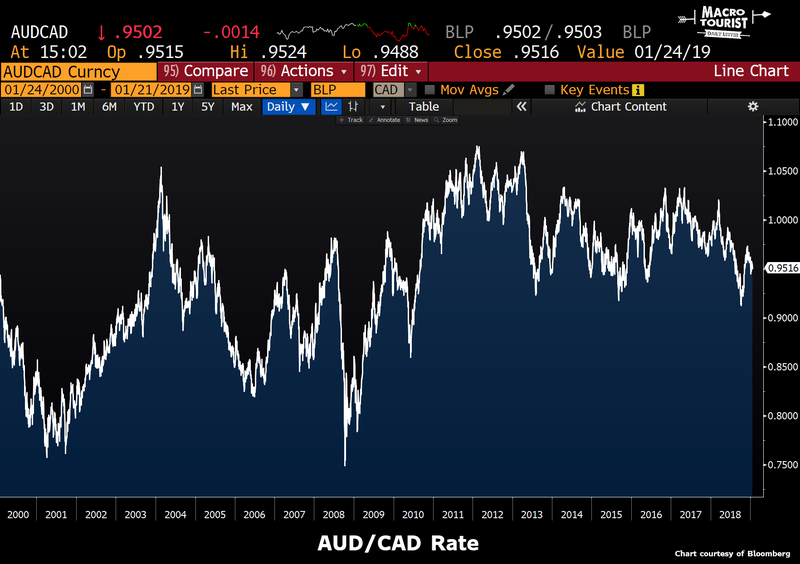 What is also pronounced and clear is that the bull move in the Australian dollar has long since past. In fact, the Australian dollar has been going down for so long you almost feel like you might have missed the party. Which brings me to my preferred way of expressing this trade. I don’t know where the US dollar is headed. I worry that too often the USD trades more like a risk-on versus risk-off instrument than actually reflecting fundamental values of the currency. And I guess gun-to-head, I am worried about there being too many US dollar bulls for my liking. So I find it hard to short AUD against USD down here. It might be the right trade - I am not disputing that! But I like shorting AUDCAD even better. You see, Canada is also a resource economy. And although Canada is dependent on China to some extent, the reality is that Canada is far more exposed to the United States. 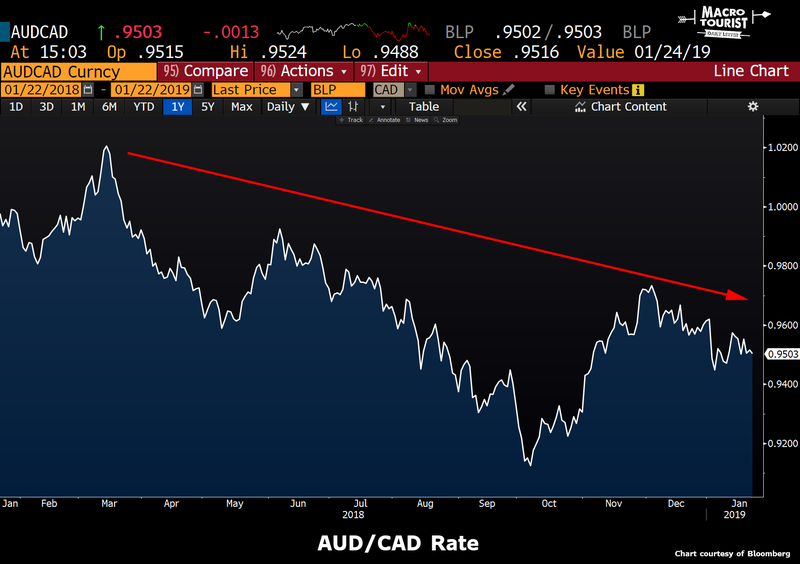 Therefore shorting AUDCAD is a way of expressing United States over China without being subject to the violent swings in the reserve currency due to global macro factors. The trade is just cleaner. On technical long-term basis it’s nowhere near as bombed out. A move back down to 0.9150 on AUDCAD looks like an easy chip shot. 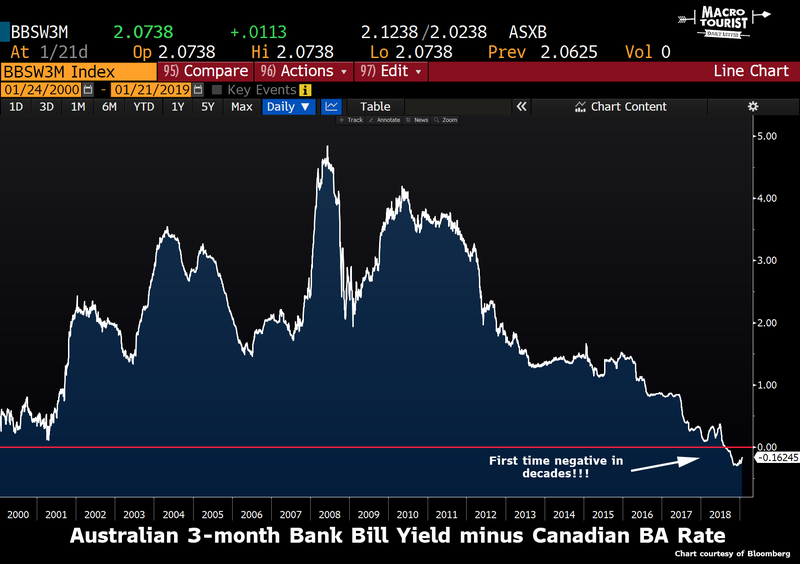 What interesting is that the Australian / Canadian 3-month bank obligation yield spread went negative this summer for the first time in decades. I know there are plenty of Canadian bears out there who believe the Canadian real estate market has also rolled over. That could be, but I think whatever pain Canada experiences, Australia will feel it worse. 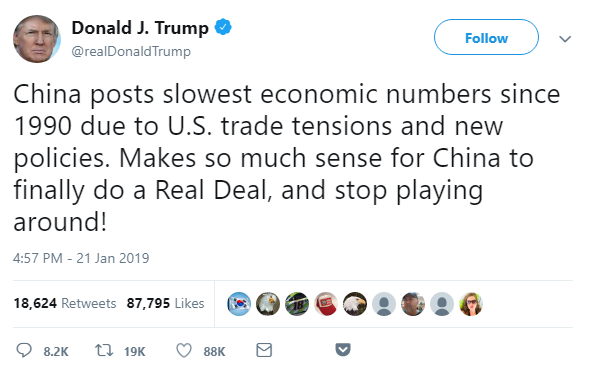 At the end of the day I would rather be long the currency of the country whose major trading partner is the United States and short that country who relies on China. We are a long way from this China slowdown being complete and shorting AUDCAD is my favourite way to play it. Remember what Felix said - no real stimulus until 2020!